It sounds like David Cronenberg’s worst nightmare, but it’s also a promising medical technology. It sounds like something out of a horror film: probes that penetrate your brain like the stinger of a wood-boring wasp. But this new biomimetic design isn’t the product of some mad scientist’s lab. Rather, it’s a collaboration between Imperial College London and the Micro and Nanotechnology Centre, and the new probes could help improve treatment for devastating neurological disorders like Parkinson’s. Currently, the best treatment for some diseases of the central nervous system is deep brain stimulation, electrical current relayed directly by brain probes. It’s essential, though, to relay the electricity to very precise spots in the brain, which makes it important to find a way to anchor the probes. “When you implant these currently, the electrode can migrate just by the motion of the patient’s head,” said one of the researchers, Andreas Schneider, explaining the problem he sought to solve. The British researchers looked to nature for their solution. 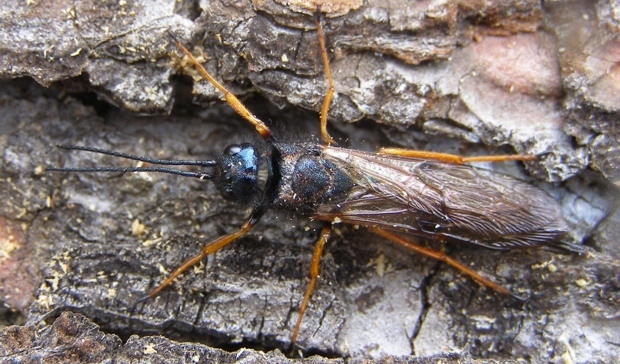 The wood-boring wasp has teeth-like microstructures on its stinger that help it drill more effectively into pine trees to lay eggs. By adding a series of tiny mechanical hooks onto the probes, the researchers think they will be able to anchor the probes in place. Of course, a feasibility study will be carried out soon, since it’s generally a good idea to move cautiously before sticking things willy-nilly inside of people’s brains. The research was funded by the U.K.’s National Institute for Health Research, through its Invention for Innovation program. This wasn’t the first time U.K. researchers had modeled elements of their probes after the wood-boring wasp. Back in early 2007, a researcher at Bath University became fascinated with how the tiny wasp was able to drill deep holes in tough wood. After studying the wasp’s unique features, a team of researchers began to model a probe after it, one so delicately engineered that “it wouldn’t rip any tissue on the way in,” said one researcher, according to The Engineer.